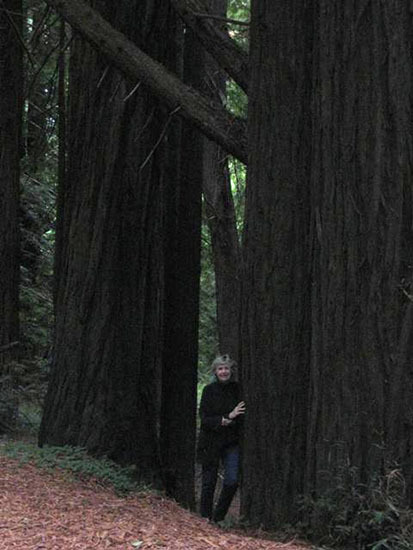 “I have always been influenced by place and especially the natural world in those places. 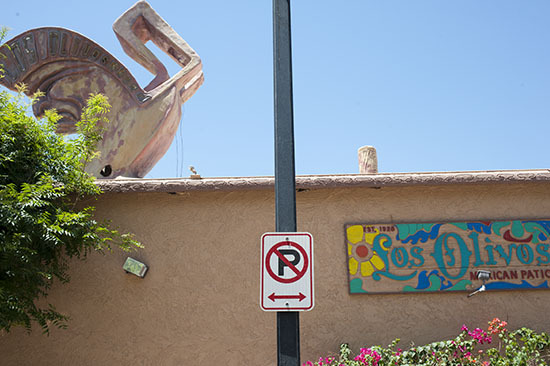 In the early 80’s, having taken up scuba diving, I did a series based on sea life called “walking tentacles.” Later, during many trips to New Mexico, I discovered mesa forms as well as Native American kivas and petroglyphs. Those sources dominated my work for over 10 years. 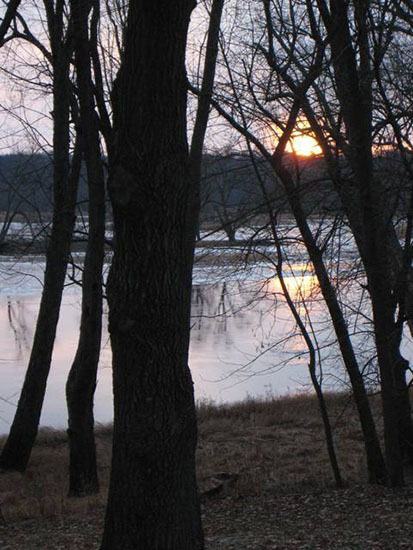 Most recently the changing light, colors, and patterns seen from our retirement home on the banks of the St. Croix River in Minnesota have informed by work. My ideas are an accumulation, my sources most often from nature and my pallet is drawn from the colors of earth, water, wood and stone. I’ve been drawn to the woods most of my life, from childhood summers at a log cabin in northern Minnesota, to the redwoods of northern California, to the tropical jungles of Costa Rica, and now at our current home on the banks of the St. Croix River. From the St. Croix shore I have photographed many sunrises, reflections, shadows and moonlit nights. These scenes continually change throughout the day, from day to day, and season to season. 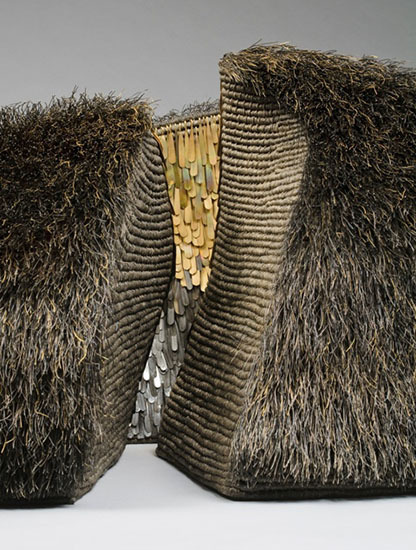 The materials I use on the surface of the coiled forms are often individually hammered pieces of twelve- to eighteen-gauge wire made of copper, tinned copper, iron, lead or brass. In addition I use waxed-linen thread and fine wire. By torching the metals I am able to alter the colors in varying degrees enabling me to blend them from darks to brights. I use this blending to interpret the colors, textures and light that I see in the natural settings. I became particularly excited about rocks ten years ago when my husband and I decided to build an addition to what was to become our retirement home. Because this home is on a river in an old glacial landscape, the dozer unearthed a mountain of boulders. Philip Johnson, the architect, said, “I never met anyone who can talk about a pile of rocks.” Well, I never met Philip Johnson. I have photographed rocks in many parts of the world. 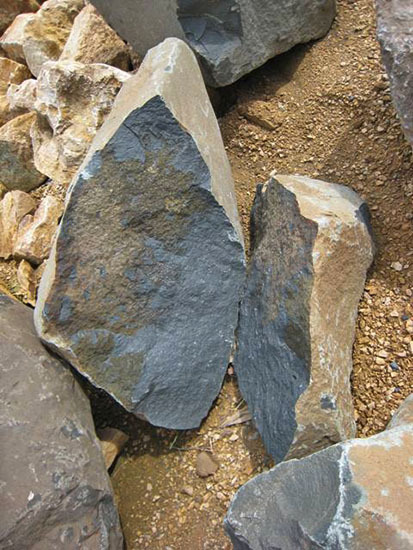 I’m interested in all sorts of rocks: broken rocks, large rocks, pebbles and boulders. I love their surfaces aged by wear or accumulations. I find many forms in their crevices and shadows. In the winter we often go to a relatively remote Pacific location in Costa Rica. I spend hours walking the beach photographing yet more rocks, driftwood, and wave and animal patterns in the sand. On the walks I always carry two bags, one for trash and one for treasure. In my studio I begin a new idea with a sketch. Most recently I have been building clay models. The models have helped me work through details and attempt more complex forms. I’m often asked how long it takes to complete a vessel. I don’t usually keep track but I do remember my first basket from the late 1970’s, three inches high, took twelve hours. 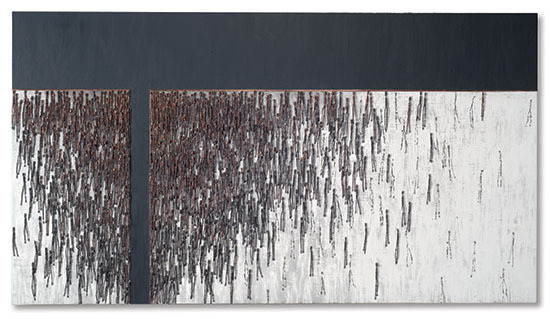 My most recent piece, which is fifty inches long, took five months. Six years ago I started doing wall panels that dealt with my concerns about population. 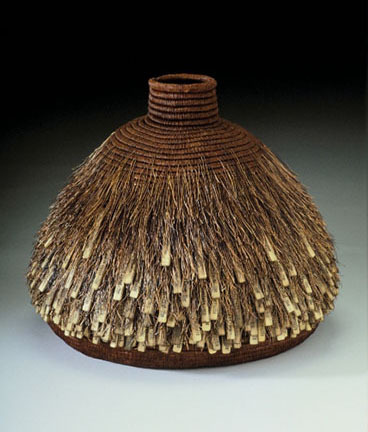 They are not baskets but the men they incorporate have been on my vessels for nearly thirty years. 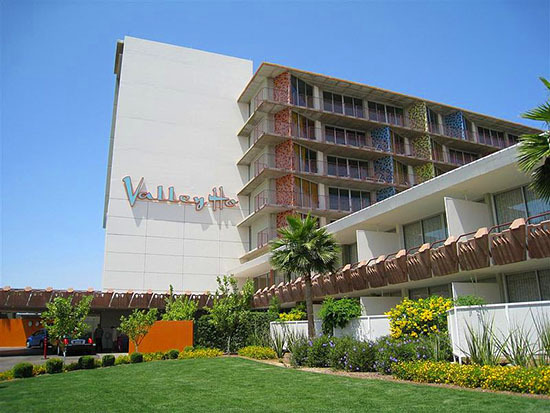 The first expression of this theme was directly on a 10 X 30-foot gallery wall. 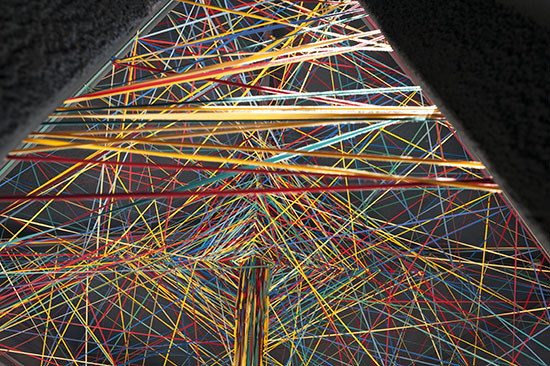 It was composed of hundreds of torched copper wire men arranged outwardly from dense to sparse. I am still working with these ideas of overpopulation, density and boundaries. A series of attractive books have wound up in our mailbox this spring. None are quite right for the beach, but each immerses a reader in another culture, locale or artist’s viewpoint — a bit of an adventure without leaving home. 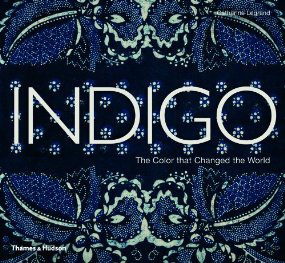 Even for fans of indigo, like me, Indigo: The Color that Changed the World by Catherine Legrand (Thames & Hudson 2012) is a revelation. The book covers geographical regions (Japan, China, India, Laos and Cambodia, Africa, Central America and Europe — who knew?) 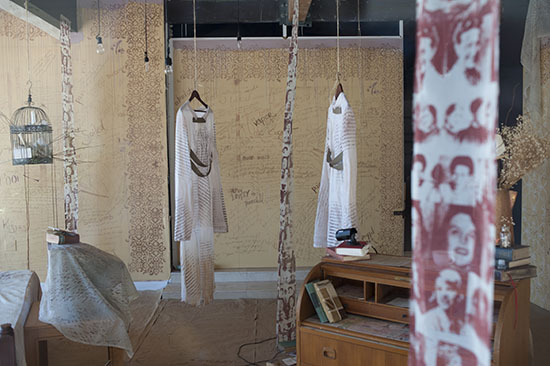 where the ancient art is still practiced and indigo forms a part of the fabric of everyday life. 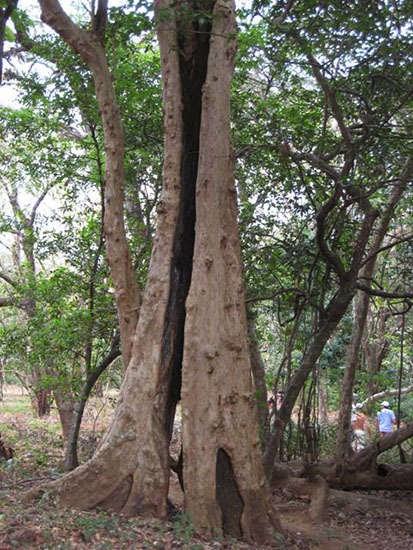 The differences and similarities in the uses of indigo in these varied locales is fascinating. There are 500 glorious photographs, many of them a full page each. It’s not a reference in the typical sense as others have covered this material more comprehensively, but a visual one. I have found myself repeatedly returning to the book and leafing through the images again just to immerse myself in the patterns and hues. 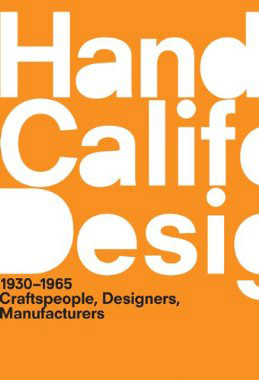 A Handbook of California Design, 1930-1965, Craftspeople, Designers, Manufacturers, edited by Bobbye Tigerman (Los Angeles County Museum of Art and MIT Press 2013) offers more of a trip through time. Designed by acclaimed book designer Irma Boom, the pages look like newsprint and are handcut and edged in day-glo orange, the same color used for the cover. The photos and illustrations are nearly all in black and white and convey the design sensibility of the period, which was a halcyon period for design — California was “a breeding ground for new ideas to flourish without constraints,” and design benefited from its many institutions of higher learning and the technical and material innovations that WWII brought to the aerospace and defense industries. 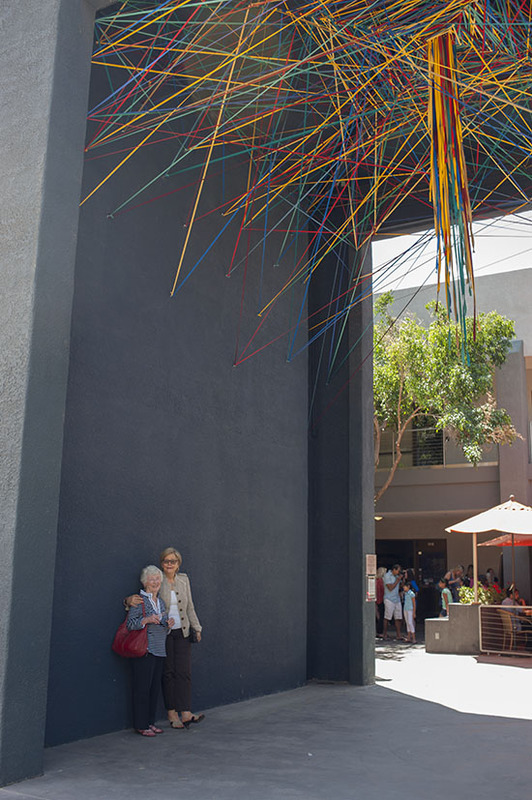 The connections and collaborations of the book’s subjects — from Harry Bertoia to Mary Ann DeWeese (Catalina Swimwear) to Charles and Ray Eames to Trude Guermonprez to Gertrud and Otto Natzler to browgrotta arts’ artists Ed Rossbach and Katherine Westpahl (featuring photos by Tom Grotta) and Kay Sekimachi — are mapped on a helpful chart. In each biography, the names of other subjects in the book appear in day-glo orange so that the reader can look for cross references. The biographies are brief and insightful. 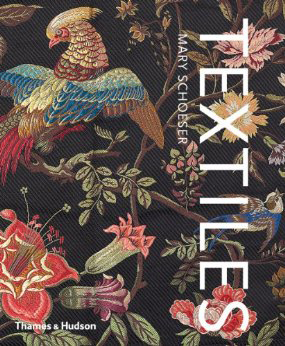 In Textiles: The Art of Mankind (Thames & Hudson 2012) Mary Schlosser sets out to explore the “continuum of creativity” that links ancient textiles to those created in the 21st century. Her chapter on structure, in which she argues that all textiles, even lengths of yardage, are three-dimensional objects takes an interesting look at non-tensional techniques, primarily basketmaking. The book contains a wealth of resources, including website addresses for artists and designers, and a staggering 1,058 illustrations. We were puzzled, though, by the author’s failure to mention browngrotta arts‘ website which has more than 1,000 images of textile art among the resources or list any of the 40+ catalogs on art textiles that we have published. Most disappointing — though she includes more than two dozen illustrations of work by Ed Rossbach, Katherine Westphal, Sara Brennan, Kay Sekimachi and Karyl Sisson, she fails to provide a website reference for any of them, even though there are images and information on each at http://browngrotta.com. Despite that omission — it’s a remarkable book, and well worth seeking out.